Translation: How could you possibly relate with me with respect to race and the racism I experience? You’re part them. And I am proud. But no one on the street would pick me out as white. That is fact. So much of how people treat you is based on appearance – an age-old phenomenon of human nature. Never considered white and never considered Asian. Is it really the best of both worlds? Or is it simply a constant reminder that you don’t truly fit anywhere? I grew up in a close-knit family, always perceiving that I was different in a way over which I had little to no control. I didn’t know the language as well as my cousins of the same age. I didn’t feel entirely comfortable Som Pas-ing every time I saw grandparents. And sometimes, I didn’t know how to properly react to things, but knew that as my mother’s adorable offspring, both she and I would be unreservedly judged on my responses. Instead, without being fully white American, I spoke impeccable English, my dad being a stickler for that sort of thing and my mom fearing that being fully bilingual contaminated my brain with a ‘foreign-ness’ that would hamper my chances in a decidedly Western world. 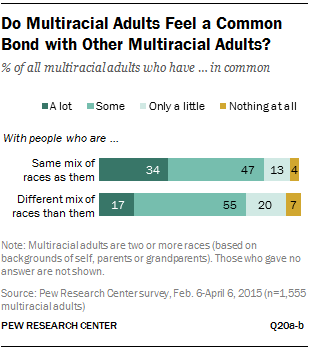 Even among other hapas or multiracials, even if you matched two people’s distinct cultural composition, each will have his or her own melding of cultures to different degrees of acceptance and understanding to form his or her identity. Applied to real life, this translates to distinct differences in experiences with regards to race and minority issues. In my case, my parents divorced when I was young. The separation between Asian and white cultures was distinct – lines drawn with the disdain that often comes with such life events. There was an Asian house and a white house with no communication between. Living primarily with my first-generation Asian mother, it wasn’t until my dad reminded me, “You’re white too, you know,” that I realized how much I related with one culture over another at that point in my life. Simple words captured how I had shaped my identity based on one perspective, but neglected to account for how much the other also pervades. I knew how to properly pray at a Buddhist temple, but could also recount to you my lines in that year’s Christmas pageant. Rice is a staple of my diet, but I could also make a mean lemon meringue pie. I bridge the influences of a strict Asian tiger mom and a hippie, openly affectionate father. On top of all of this, I am, in many ways, quintessentially American. Friends have had markedly different experiences. Third- and fourth-generation hapas have expressed regret and loss at their own tangible separation from cultures that are inevitably represented on their faces. Not knowing languages or how to cook cultural foods, inability to communicate with family elders, failing to fully grasp the meaning behind traditions, and still being regarded as part of this group in society can make you feel like an imposter – even if an imposter by circumstance – where you can’t live up to implicit expectations coming from all sides. Still, this duality also gives an unprecedented freedom to choose what you believe and what you value. Young first-generation immigrants may also experience this kind of freedom as a result of being thrust into a new culture and society. While some cultural ideals complement each other, others compete. If they do compete, you or someone else (usually parents) must choose which to live by. Your parents and influences, assuming that your parents are active in your life, build so much of who you are. But in some cases, being two or more requires conscious choice, rationale, and justification. It also fosters greater openness to entirely new ideas and ideals, where it seems true innovation and uniqueness can flourish. Looking to the future, my potential children will have a completely different identity, a mixture of cultures as well as parts of the collection that I’ve become. It leads to a number of questions into how multiracialism as an identity will affect dominant understandings of race, culture, and values into the future. 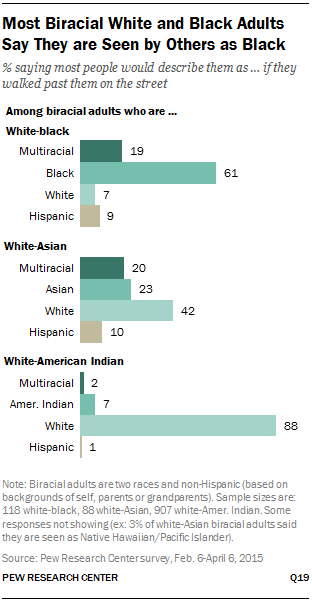 Multiracial Americans as a demographic group is growing three time as fast as the population as a whole. It’s increasingly becoming a natural consideration for inclusion and a focus of research, policy, and politics. So how do we deal with a population group that doesn’t necessarily mesh within their own family units, let alone a larger subgroup, that is based on a self-constructed, often fluid identity? Can we get real answers to any of our questions about multiracials when the diversity of backgrounds and self-proclaimed identities that we are attempting to make fit are inherently disjointed?